Лаборатория нанобиоструктур была создана в 2011 на основе двух научных групп – группы молекулярной бионики и группы супрамолекулярной химии, которые ранее входили в состав лаборатории полимеризационных процессов. разработка полимеров и многокомпонентных полимерных конструкций для применения в медицине, сельском хозяйстве и экологии. Научные исследования проводятся в рамках грантов, поддерживаемых Российским фондом фундаментальных исследований и Российским научным фондом. 2. Pinguet C.E., Hoffmann J.M., Steinschulte A.A., Sybachin A., Rahimi K., Wöll D., Yaroslavov A., Richtering W., Plamper F.A. Adjusting the size of multicompartmental containers made of anionic liposomes and polycations by introducing branching and PEO moieties Polymer, V. 121, p. 320-327. 3. 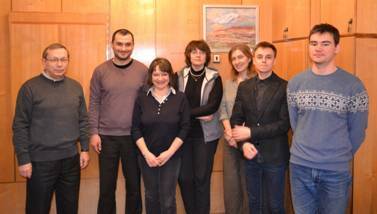 Yaroslavov A.A., Efimova A.A., Rudenskaya G.N., Melik-Nubarov N.S., Grozdova I.D., Ezhov A.A., Chvalun S.N., Kulebyakina A.I., Razuvaeva E.V. An electrostatic conjugate composed of liposomes, polylysine and a polylactide micelle: a biodegradability–cytotoxicity relationship Mendeleev Communications, V. 27, № 3, p. 299-301. 6. Panova I., Sybachin A., Spiridonov V., Kydralieva K., Jorobekova Sh, Zezin A., Yaroslavov A. Non-stoichiometric interpolyelectrolyte complexes. Promising candidates for protection of soils Geoderma, V. 307, p. 91-97. 8. Sybachin A.V., Zaborova O.V., Pergushov D.V., Zezin A.B., Plamper F.A., Müller A.H.E, Kesselman E., Schmidt J., Talmon Y., Menger F.M., Yaroslavov A.A. Complexes of star-shaped cationic polyelectrolytes with anionic liposomes: towards multi-liposomal assemblies with controllable stability Polymer, V. 93, p. 198-203. 9. Spiridonov V.V., Panova I.G., Topchieva I.N., Zakharov A.N. Metal-free thermally-responsive pseudohybrid nanoparticles based on 2-hydroxypropyl-β-cyclodextrin RSC advances, V. 6, p. 44113-44118. 10. Yaroslavov A.A., Zaborova O.V., Sybachin A.V., Kalashnikova I.V., Kesselman E., Schmidt J., Talmon Y., Rodriguez A. R., Deming T.J. Biodegradable containers composed of anionic liposomes and cationic polypeptide vesicles RSC advances, V. 5, № 119, p. 98687-98691. 11. Spiridonov V.V., Zakharov A.N., Panova I.G., Afanasov M.I., Perov N.S., Topchieva I.N. Self-assembling of highly substituted 2-hydroxypropyl-β-cyclodextrin in the presence of in situ-formed iron oxide nanoparticles to produce magnetically ordered water-soluble supramolecular adducts Colloid and Polymer Science, V. 293, № 5, p. 1329-1337.